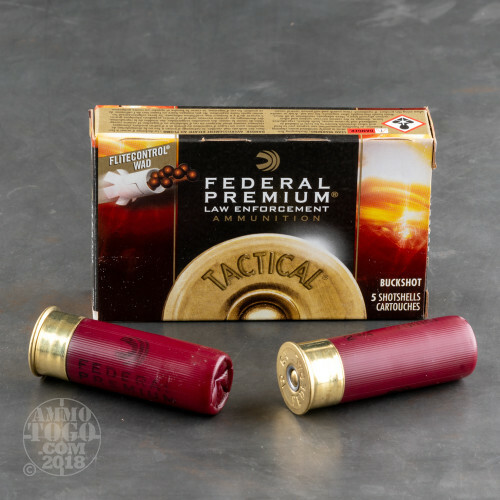 Federal Premium has been producing high-quality ammunition since 1922. 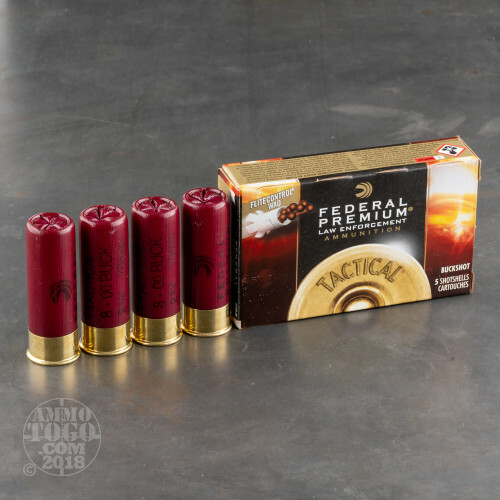 Ideally suited for law enforcement and home defense, these Federal Premium LE Tactical loads transform the most basic 12 gauge shotgun into a precision tool without expensive chokes or barrel alterations. 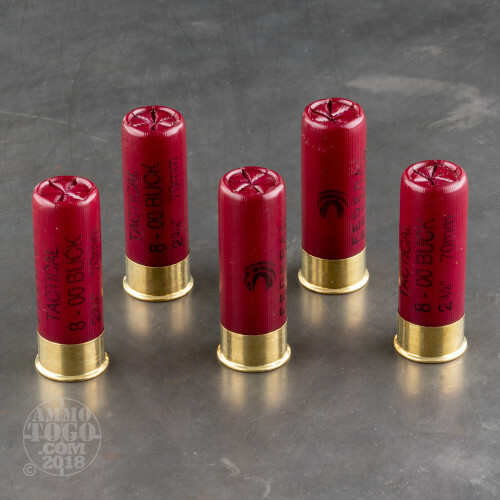 Each of these 2 ¾ inch shotgun shells is loaded with 8 pellets of copper-plated lead 00 buckshot. Featuring Federal’s patented FLITECONTROL wad system, these loads deliver reliably uniform shot patterns. With this unique wad design, the shot is contained in the wad for an extended period of time, slowly backing away from the shot rather than dispersing it in a cloud as soon as it leaves the muzzle. 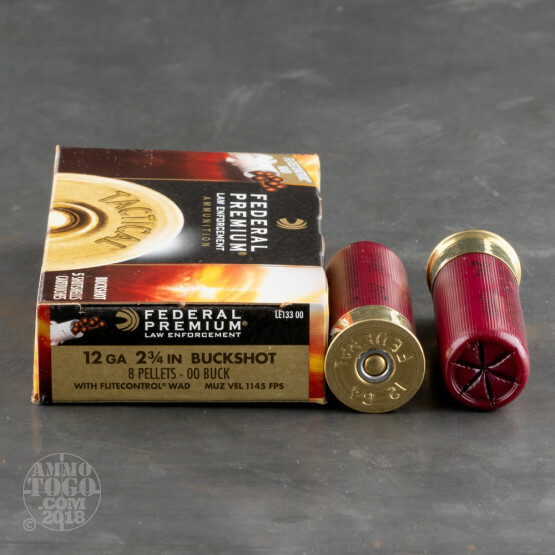 Federal Tactical buckshot also features a solid brass head for reliable function and extraction. Engineered to reduce felt recoil, these loads help facilitate quick recovery for increased shot-to-shot accuracy. To top it off, all Federal Tactical Shotshell offerings are loaded with the famous, Basic-Lead Styphnate 202 primer. This package contains 250 rounds of Federal LE Tactical Low Recoil 12 gauge shot shells. Each round produces a consistent muzzle velocity of 1145 feet per second. Works great in my Benelli M2 Semi-automatic shotgun. Cycles great and nice patterns at 7 and 15 yards. Low recoil that my shoulder appreciates. Very fast delivery, and exactly what I ordered. I had contacted AmmoToGo by email in advance, to be sure they really had the item in stock as shown on the website, and they got back to me within an hour - so I ordered. The box of 250rds arrived in excellent condition, in only 3 days. I'll be ordering from ATG again soon, with confidence. Load has very low recoil and patterns very tight at 15 yards. Probably a good load for a pump gun. At relatively 1,100 FPS, and low recoil, it does not have the capability to cycle in my Benelli M1 Super 90 Entry gun. Spent hulls hang in the ejection port quite often, or don't have the back pressure to clear the chamber of the spent round. Super fast delivery, nice price, This is the third time I have ordered from Ammo to go". I plan on ordering again!